Fashion models don’t worry about their weight as much as professional cyclists. In the elite levels of cycling, lightweighting takes on a religious significance. Every gram on a serious rider and their bike is blessed in its removal or absence. Racers go crazy: dieting, drilling holes in their bikes,throwing away water bottles during a ride… anything in their desperation to get an edge on the competition. Bike companies that make high-end production bikes cater to that obsession to lose weight. The largest part of the bike, the frame, gets a lot of attention. A bike frame may appear simple to the casual cyclist. But if your last use of a bike was to deliver newspapers, getting into a bike shop and picking up a modern racing bike will immediately inform you that the game has changed. At less than a kilogram (2.2 lbs), you can hold some bike frames on the fingers of an outstretched hand. Now, get used to paying more for less. These superlight bikes are not cheap. The most expensive ones in the bike shop rival the least expensive cars at the dealership. But when every gram translates into seconds off the clock—or staying with younger, fitter riders on a Saturday group ride—it’s “damn the cost and full speed ahead”. 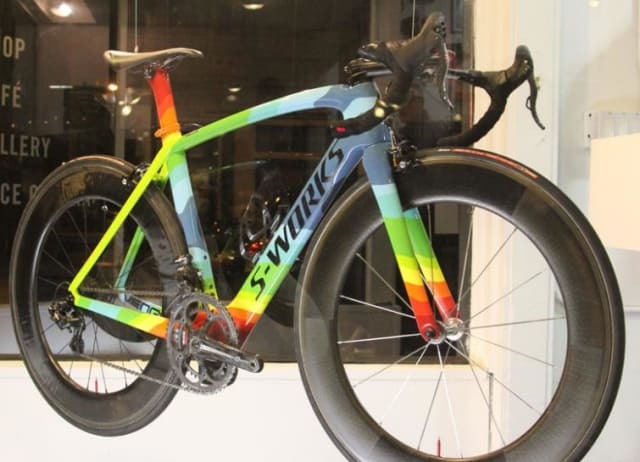 Chances are the lightest and most expensive bikes will have a carbon fiber frame. Originally used as filaments in lightbulbs in 1860, it was not till a hundred years later that carbon fiber’s high strength to weight was found useful in British aircraft. It is now also a favorite with automotive engineers trying to meet fuel efficiency demands. Carbon fiber composites can be found in various high-end sporting goods, like tennis rackets, golf clubs and bikes. But in the race to make bikes lighter and lighter, the walls of the frame tubes are getting paper thin. “We can make them even lighter,” said one bike designer, “but I wouldn’t be able to sleep at night.” The international body that governs all the big races, the UCI, imposes a lower limit of 6.8kg (15 lbs) for a full bike, knowing bike racers will put themselves—and other riders—at risk with bike frames that could too easily collapse. How to make the lightest frames and still get some sleep? Enter simulation software. Analysis of composite materials is hardly straightforward. By comparison, metal, with uniform, identical (“isotropic”) properties in all directions, is a piece of cake. A metal part can be analyzed with single, simple material properties, like one modulus of elasticity good for the whole part. A carbon fiber part, on the other hand, will not only have two materials, it demands the analyst pay attention to the orientation of the anisotropic material (the fibers) , which can vary within each ply. Carbon fibers have to stay somewhat attached to the material in which they are embedded, AKA the “matrix”, usually an epoxy. Carbon fibers will resist forces parallel to their orientation quite nicely, having a strength higher than strong metal alloys. It is the job of the matrix to keep the fibers in their place. Out-of-plane forces are resisted solely by the matrix material, which is considerably weaker than carbon fiber. Composite parts also lack the toughness of metal parts, a property material scientists refer to as “energy release rate.” Composites are prone to abrasion. The method of making a shape using carbon fiber is like no other type of manufacturing process. 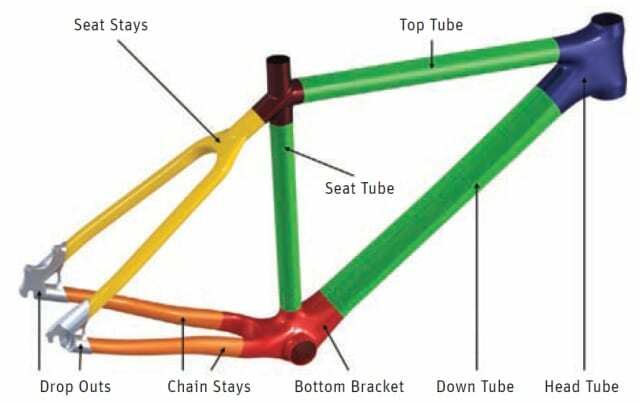 Carbon fiber bike frames usually start with a “lay-up,” where the layers of “prepreg”, cut to shape, are draped one on top of the other, varying fiber direction, sometimes over a mandrel. The whole mess is put into a mold; then the mold is put in an oven to cure. Bertram Stier, an avid mountain biker, is also a research engineer at Collier Research, a smallish CAE vendor (20 or so employees) that makes HyperSizer, simulation software for composite fiber material. 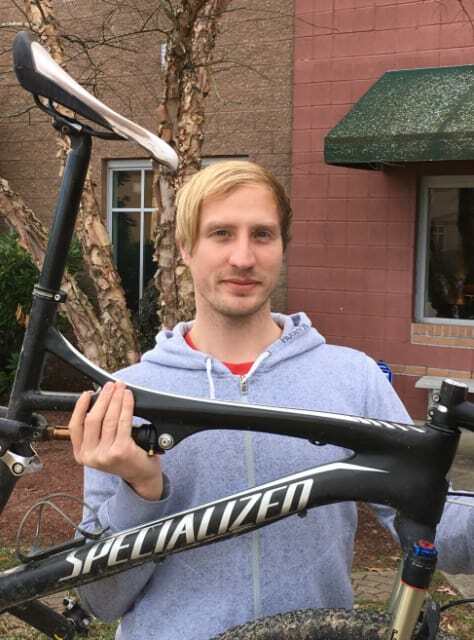 Stier wants to transition from the aluminum alloy bike frames (he owns three mountain bikes) to bicycles with lighter weight composite frames—but not until his software assures him they are safe and until they get less expensive. Stier has a masters degrees in structural mechanics and light weight design and is on his way to a PhD in multi-scale analysis of fiber reinforced composites at Germany’s RWTH Aachen University. He presented on “Facing the Challenges of Computational Composite Bike Frame Optimization” at the Cyclitech event, organized by JEC and SPE, held last December in Newport Beach, CA. Collier’s HyperSizer is a structural analysis program that helps in the analysis and optimization of composite material parts. In the case of bike frames, it can adjust the thickness of the frame to react to stress distributions, thickening the walls where stress is highest and thinning elsewhere to save weight. 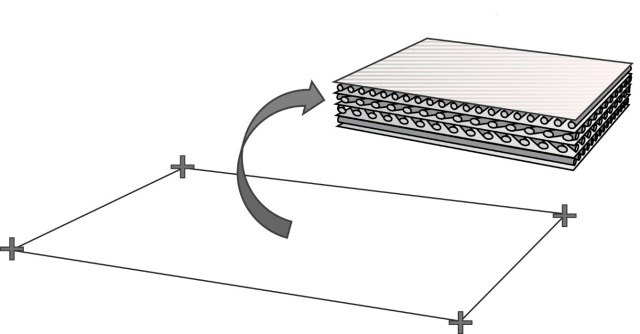 The program will show the number of layers of carbon-fiber-impregnated sheets, or plies, needed to affect the thickness. 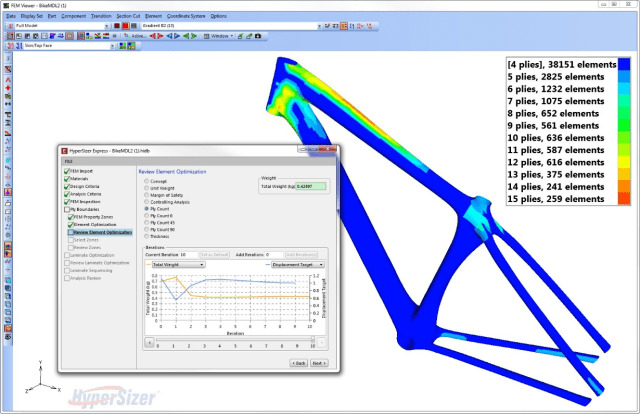 HyperSizer can add plies “internally,” so it does not change the look of bike frame. This result can be given to the shop so the plies can be applied. Used in military and aerospace applications, HyperSizer has been made simpler to use and is offered in an Express version. With the software, bike designers and engineers in other sporting goods companies, automotive components makers or small- and mid-size manufacturers in general can use the application without needing the advanced degrees or dedication of fully committed analysts common to large firms, such as in the aerospace and automotive industries. But don’t get Stier started on how a bike frame would actually be hard compared to an aerospace part. “Although, on many levels, an aircraft wing is certainly more complex than a bike frame, there are some details in a bike—such as highly doubly curved surfaces and joint sections—that are actually more complex than in an airplane,” he says. Before a new design goes into production, it should be fatigue tested. Fatigue can tear a carbon fiber frame apart. Also, cyclists crash, drop their bikes and, in what is the most embarrassing accident ever, ram it into the garage while it is mounted to the car roof rack [Ed note: Author not admitting to having done this]. A new frame design will undergo one torture test after another, simulating as many mishaps as possible, with each failure potentially returning the design back to the designer. This trial and error, often lengthy, rubs Stier the wrong way. He claims his company’s software takes much of the guesswork out. HyperSizer can evaluate many design iterations and settle on the most promising ones. The designer can essentially craft a final game plan for the craftsman to execute, with confidence that it will sail through the torture tests being planned for it. Proper analysis tools can greatly shorten the amount of testing needed, says Stier. HyperSizer Pro and HyperSizer Express, like any structural analysis program, will run an analysis to calculate forces and stresses. Then, the optimization kicks in to add material (sheets of prepreg cut to a pattern) where the higher stress calls for it. HyperSizer is smart enough to add material on the inside (important when designers will not tolerate anyone messing with how the part looks) or the outside (if the internal volume is to be fixed) or preserve the midplane, adding thickness equally inside and out. Collier Research, founded by Craig Collier and headquartered outside of Washington DC, claims to be the first software spinoff from NASA­­—predating even NASTRAN. While small compared to CAE giants such as ANSYS and MSC Software, with a staff of about 20, it may have the highest ratio of engineers to employees of any CAE company, with 19 out of 20 being degreed engineers, many with advanced degrees and PE status.